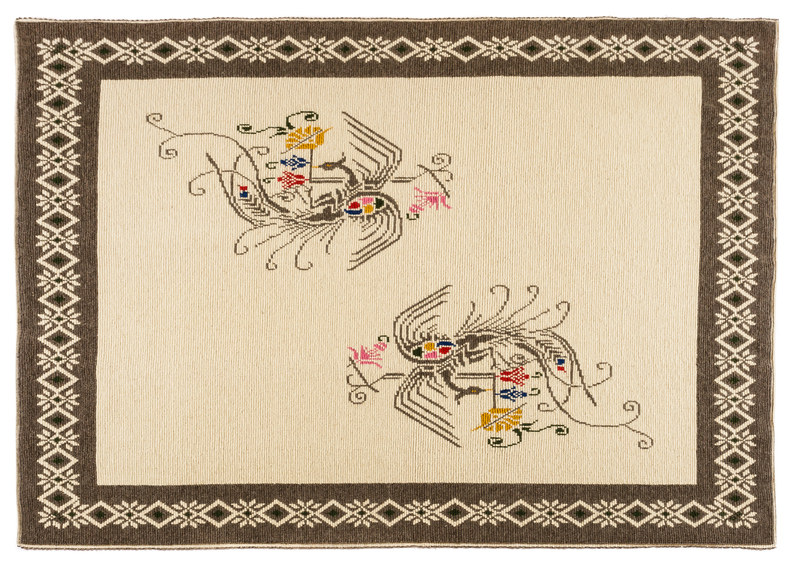 This elegant large woollen carpet is richly decorated with colourful motifs of plants and birds. 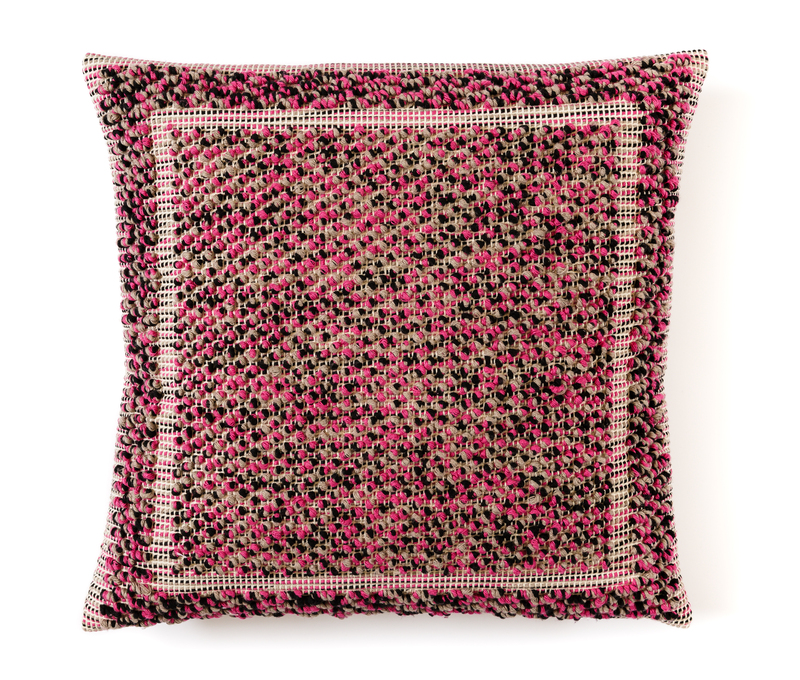 Crafted using the pibiones relief technique in the full-bodied (tutto pieno) variant, it can be customised in size, composition and colour combinations. 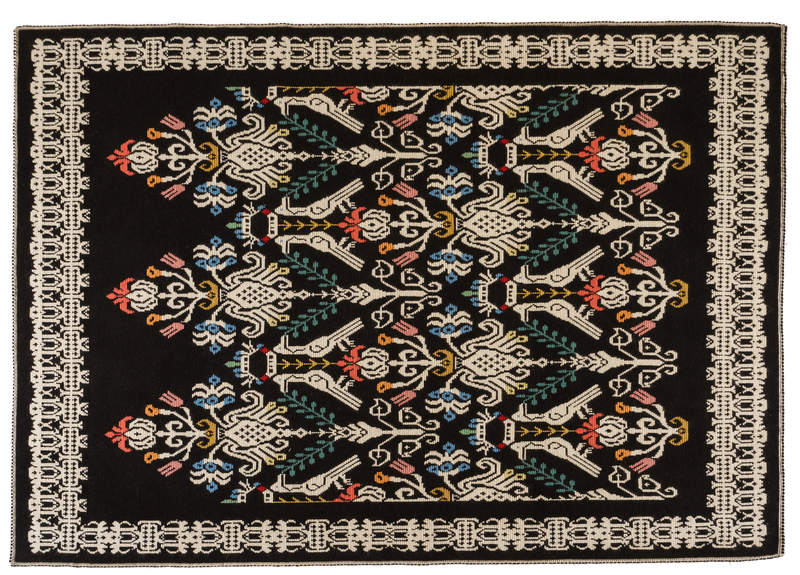 This elegant large woollen carpet features sophisticated decorations of stylised birds with long-feathered tails, skilfully crafted with wisely chosen colour combinations. 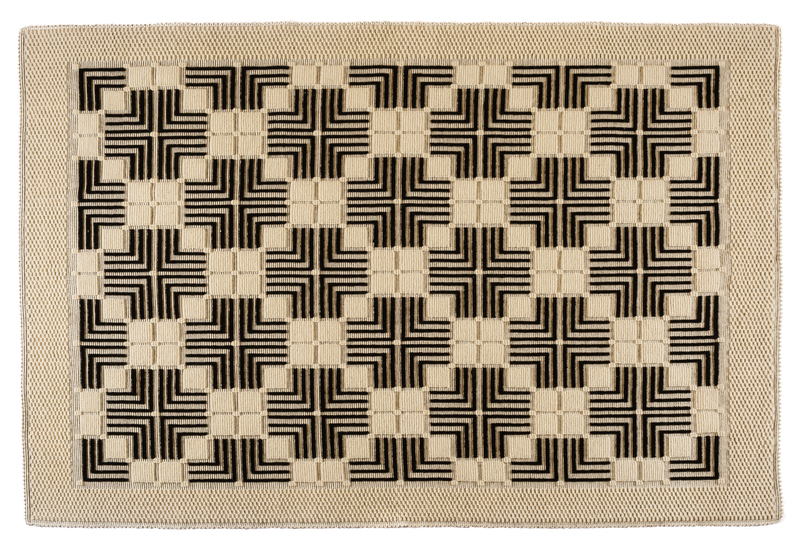 The modern geometric decoration, obtained by wisely balancing and alternating black and white, characterises this refined woollen carpet made using the technique of semi-pieno (half-bodied) pibiones relief technique. 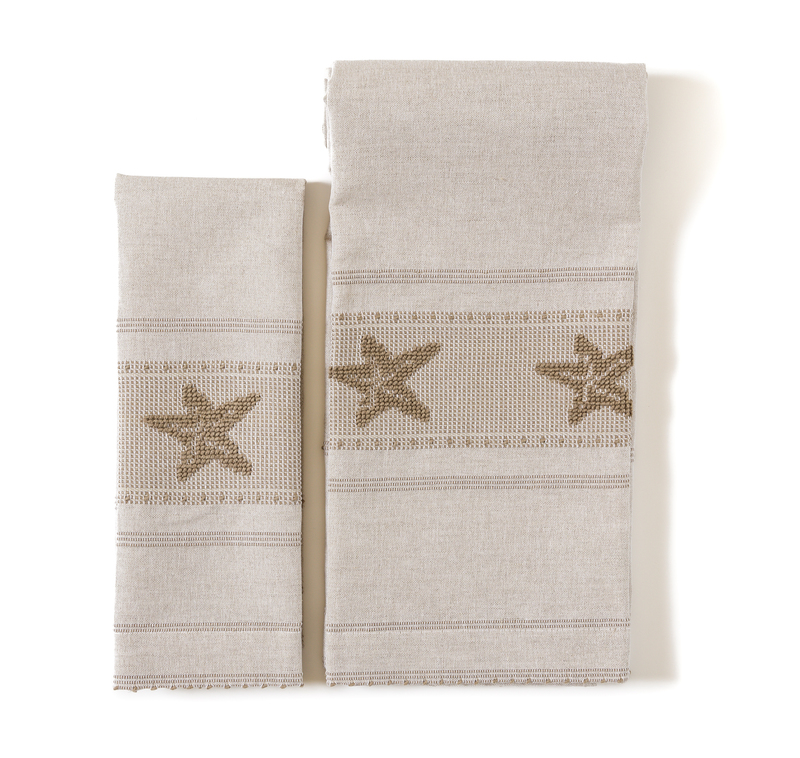 Elegant and refined, these linen and cotton towels have fine decorative bands with motifs taken from the local tradition realised with the pibiones relief technique. Available in many colours and decorative variants, they can be further customised in size and decorations. Franco Tatti’s Arte Sarda Il Tessile family business is representative of the lively artisanal context of Samugheo, a village in the province of Oristano which is characterised by a well-established textile tradition. Franco and his wife Emanuela set up their workshop Arte Sarda Il Tessile in 1989, building on local traditional loom weaving by means of innovative equipment capable of meeting the new demands of the market. These creations on the one hand preserve the precious techniques and decorations, and on the other put forward elegant solutions that fit into the contemporary context with distinctive features evocative of the past. Large carpets reproduced and reinterpreted according to a new taste are complemented by a wide range of fabrics and drapery, tablecloths and high-quality textile décor with a marked aesthetic sense. Franco promotes his products in his large workshop in Samugheo and in the outlet in Oristano, as well as in the major local craft shops in the main tourist centres of the island. Every year he participates in the renowned Mostra dell’Artigianato Sardo (Sardinian Handicraft Fair) in Samugheo. The production features a variety of products in order to meet diverse specific needs. Carpets of different sizes, bedspreads and textiles for the bedroom, cushions, curtains, tablecloths and other coordinated cotton, linen, wool fabrics are crafted according to the pibiones relief technique. The attention given to details starts from the preparation of yarns and the careful warping of the looms, through the choice of crafted decorative motifs, thus guaranteeing a unique product. The pibiones relief technique and weaving of fabrics are performed with manual and semi-automatic looms according to the specific requirements of the product, using natural cotton, linen and wool yarns. The materials are spun and twisted with special machinery for the preparation of yarns and for warping.